Sako is one of the most popular brands among UK stalkers, and with good reason. The Sako 85 Carbonlight is the newest additon to Sako’s ever-popular range. While it shares all of the features of the popular Finnlight, the Sako 85 Carbonlight is stocked with carbon fibre. Dominic Griffith finds himself tempted to make a purchase. For more on rifles, read Dominic Griffith’s review of the Savage AccuStalker, a fantastic and inexpensive rifle. Sako remains one of the most popular brands among UK stalkers and this is mainly attributable to its renowned build and barrel quality. Durability, reliability and value for money are synonymous with Sako and for those demanding performance with functionality there is, frankly, little reason to look further afield. The Sako 85 Carbonlight brings something extremely alluring to the firm’s much-admired range. While based on the highly respected 85 action and sharing all other features of the popular Finnlight, this rifle is stocked with carbon fibre. The effect is to shave half a kilogram (just over 1lb) off the weight of a normal composite stock and bring the whole rifle down to just 2.4kg (5.29lb), making it the lightest that Sako has ever manufactured. The carbon fibre stock, which uses the CFRP technology used in the car and aerospace industries, features a soft-touch patterned surface, a right-hand palm swell (left-hand version not currently available) and cheekpiece. It is extremely light yet durable, rigid and strong, and features a flat surface for the firm attachment of a bipod. Sharing the stainless steel, fluted barrel of the Finnlight as well as its stainless steel action, crisp, single-stage trigger, unload button and detachable, five-shot steel magazine, the rifle comes pre-threaded for a 14/1 moderator. Available in a somewhat limited calibre range of .22-250, .243, .260, 7mm-08 and .308, it nevertheless satisfies the requirements of pretty well all UK-based stalkers. As you might expect, the Sako 85 Carbonlight sells at the top end of the Sako range. At £2,600 it represents a £740 premium over the Finnlight and may fall outside the reach of some stalkers. However, it remains far from an expensive rifle, well below the price of many of the popular brands offered in the UK. If I were to consider a Finnlight I would pay the excess for the Sako 85 Carbonlight. The Sako 85 Carbonlight was fitted with a Steiner Ranger 3-12×56 scope, a combination that worked perfectly. The test rifle came in .308 and was fitted with a Steiner Ranger 3-12×56 variable telescopic sight with a very fine and illuminated reticule. Despite the lightness of the stock and the presence of a Stalon lightweight W110 sound moderator, the balance remained as good as on all Sakos. It was a pleasure to handle, mounting effortlessly and naturally to the shoulder. I was impressed by the scope which is German in quality but not in price. 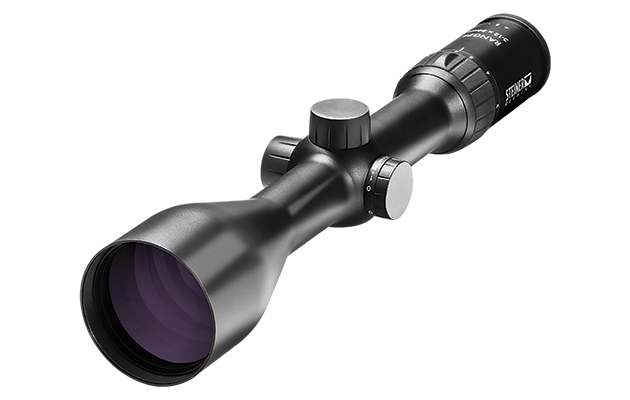 At £775 it is a fraction of the price of most quality scopes while not appearing to offer any compromise in features or performance. Over an almost 30-year career I have owned a 75, an 85 and a Finnlight– all exceptional. The Sako 85 Carbonlight, however, appears to eclipse anything that I have previously experienced. I accompanied GMK’s chief tester Derek Boyes to his range near company’s headquarters. The rifle was unused and boxed. We mounted the scope and had the rifle zeroed with Sako’s own 123-grain ammunition in just three shots. My first three-shot group, supported at 100 metres, cloverleafed to the point that it was almost impossible to differentiate between the shots; it was, in effect, a single hole. This is the best group that I have shot with any reviewed rifle over the past three years and, yes, it might have been just chance. However, the first two shots of my second group also touched tightly with the third shot pulled just under a centimetre right, which was definitely my error. This is exceptional accuracy from a production rifle and represents the refinement that you would expect from a significantly more expensive, custom-built product. It also demonstrates the perfect match of scope, moderator and ammunition in this particular .308. While I was expecting a great rifle, I was bowled over by the Sako 85 Carbonlight and if I were thinking of replacing my Finnlight, this is, without doubt, the rifle I would choose.